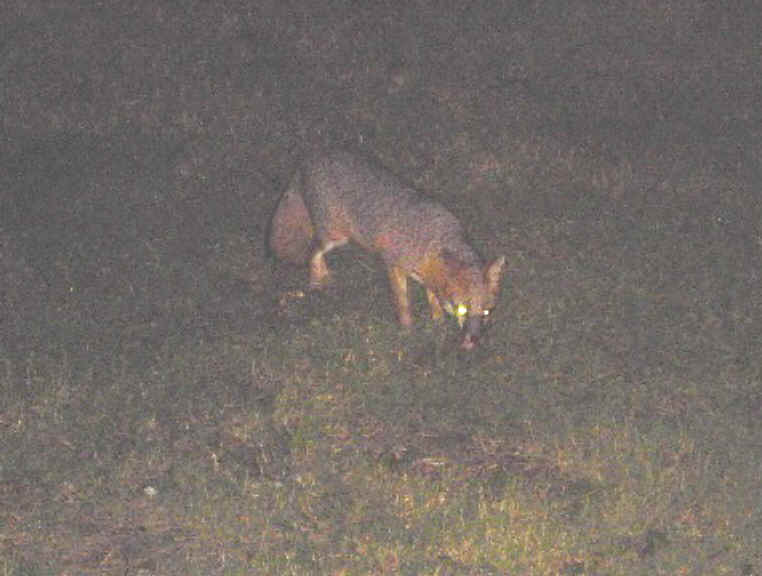 (Our Neighbors The Foxes - Grey or Gray Fox (Urcyon cinereoargenteus) - 28) This photo and the next 4 were submitted by David C. Dillard, who write (in part): These photos were taken at night with a digital camera. It was in Duck, NC in the Outer Banks. I was smoking a cigar outside and thought is was a big cat at first. I called to it and it came closer. I went in our timeshare cottage and got some food to throw to it. It seemed very tame but in the one with the red eyes it was less than a yard away so I ran back in the cottage almost knocking my wife over to get my camera. This place has cut all the hedges down where cats would hid. We feed the cats each year during our week, since we couldn't bring our dogs or birds with us. I was amazed at seeing this grey fox so close and in an area with not much woods. 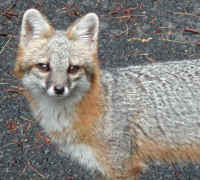 I am from the country and have raised raccoon and many other wild animals but never saw a fox. So beautiful. I didn't tell anyone we saw it fearing they would try to trap it.